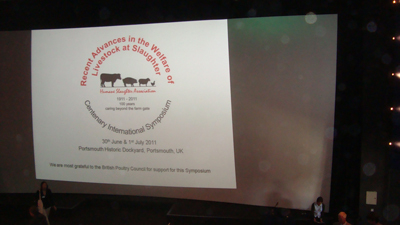 The first international symposium on animal welfare was held in Portsmouth (UK) from 30 June to 1 July 2011 to mark the centenary of the Humane Slaughter Association, a British organisation founded in 1911 which operates in the field of training and research into the welfare of livestock. The results of recent research projects and the characteristics of new operational solutions designed to improve the welfare of livestock during slaughter were presented at the symposium, focusing on the current international scenario and the possible opportunities for use of the latest scientific and technological applications on a global scale. Experts from the G. Caporale Institute took part in the proceedings, presenting the results of a research project funded by the Italian Ministry of Health relating to the effects of long-distance transport on the welfare of lambs, and the quality of their meat. The symposium was attended by researchers and representatives of the competent authorities and international protection organisations from 25 countries.